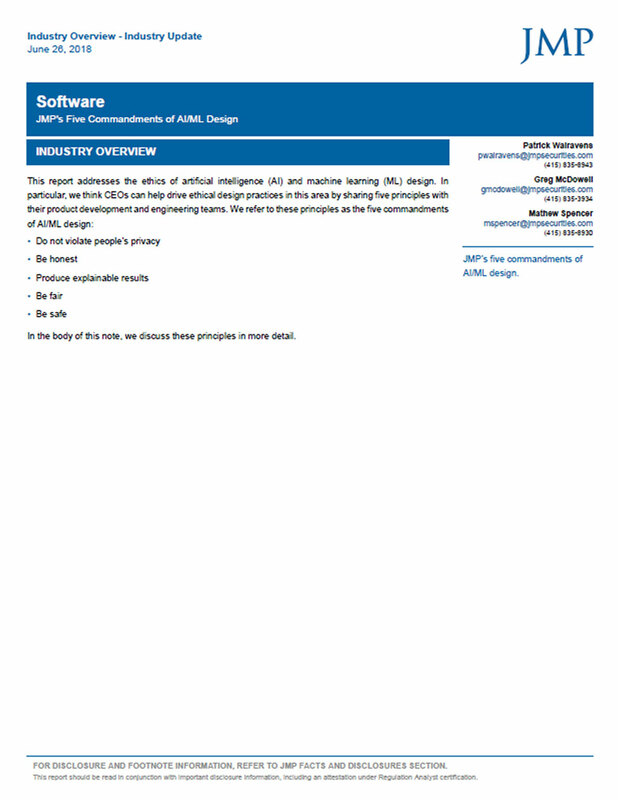 Learn more about how Kyndi helps customers create fully explainable, auditable AI knowledge and assets. Kyndi™ COO Amy Guarino joined Peter Burris of SiliconANGLE to discuss black box AI challenges and how organizations are leveraging Explainable AI™ to unlock insights from their unstructured data. Singularity Hub’s recap of SXSW panel discussion “Ethics and AI: How to Plan for the Unpredictable,” on which Kyndi CEO Ryan Welsh was a panelist. Kyndi™ CEO Ryan Welsh was on Varney & Company to discuss how high-frequency trading algorithms are driving market volatility. Kyndi™ CEO Ryan Welsh was quoted in the ABC7 News report on the New Zealand mass shootings. Kyndi™ CEO Ryan Welsh joined Digital Trends Live to talk Explainable AI™, barriers to enterprise AI adoption, and more. Kyndi™ CEO Ryan Welsh joined the AI in Industry podcast to talk about unique data challenges in the defense industry and how to handle them. Kyndi™ COO Amy Guarino discussed Explainable AI™ on the CRM Radio podcast with Paul Petersen. New York Times technology writer Steve Lohr featured Kyndi in an article discussing innovative new approaches to artificial intelligence. 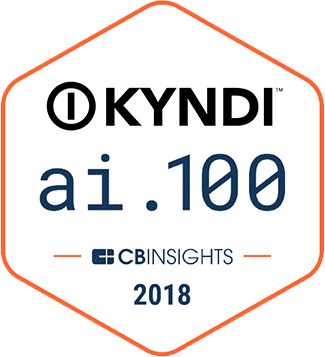 Fortune Magazine’s coverage of the CB Insights AI 100 list, which Kyndi was named to. Kyndi™ CEO Ryan Welsh was interviewed by John Furrier of SiliconANGLE Media about Explainable AI and robotic process automation. Kyndi™ CEO Ryan Welsh was recognized as one of The 30 Most Influential Entrepreneurs To Watch by Insights Success magazine. Kyndi™ COO Amy Guarino was featured as one of the 2018 Successful Leaders in Tech by CIOLook magazine. Kyndi CEO Ryan Welsh joined GSK Head Digital, Data and Analytics Vern De Biasi as he spoke about the challenges of risk management and how GSK is using AI to address them. Kyndi CEO Ryan Welsh, former DoD CIO Dr. Linton Wells and VP Kyndi Federal Amandeep Dhillon discuss the importance and impact of Explainable AI and what it means for your agency. On-Demand Webinar, Explainable AI – What is it? Why do you care? A Discussion between Ryan Welsh, CEO, Kyndi and Don LaVallee, former Director of Strategic Business Operations and IT at SHARP Microelectronics of the Americas. Kyndi COO Amy Guarino joined David Seuss, CEO of Northern Light Group, for a webinar hosted by KMWorld Magazine. Kyndi™ COO Amy Guarino will be hosting a session on leveraging AI to solve business problems in government and financial services. Kyndi™ CEO Ryan Welsh will be a panelist at the AI for Finance event presented by the Silicon Valley CFO Leadership Council. Kyndi™ CEO Ryan Welsh will be on the “Ethics and AI: How to Plan for the Unpredicatable” panel presented by Booz Allen Hamilton. CEO Ryan Welsh will be presenting for Kyndi™ at the 2019 Montgomery Summit, where 150 emerging private companies are selected to present to venture capital investors, entrepreneurs, and corporate executives. Kyndi™ COO Amy Guarino will be one of three featured panelists from high growth startups speaking at the quarterly Women in Sales event. Kyndi™ CEO Ryan Welsh presented at the conference’s Innovation Showcase on December 5th. Kyndi COO Amy Guarino was on the Solving Real World Problems with AI panel on November 7th. Location: JW Marriott | Washington, D.C. Artificial Intelligence and Business Ethics: Friends or Foes? Kyndi™ Founder and CEO Ryan Welsh was one of the conference’s featured speakers on September 20th. Kyndi™ was one of ten startups selected to present at the 2018 Startup Showcase. Kyndi™ Founder and CEO Ryan Welsh was a panelist at the event, which focused on trust and transparency in human-AI collaborations. Kyndi™ was selected to demo its Explainable AI platform at FinovateSpring2018. For Kyndi, conceptual graphs represent knowledge. Our Cognitive Memory patent works with and manipulates conceptual graphs, making it possible to accomplish different tasks very rapidly. For machines to understand symbols (which represent knowledge), domain ontology—a range of background knowledge—is needed. Our Conceptual Relativity patent explains some of the methods Kyndi uses to create domain ontologies for new domains. Kyndi’s Quanton patent has found a way to emulate the results of a permutational quantum computer for a large class of problems relevant to the Kyndi solution, specifically to the creation of ontologies and to making inferences from a large volume of data. True Natural Language Understanding: How Does Kyndi Numeric Mapping Work? Kyndi is pioneering methods that bring natural language understanding to the enterprise, allowing knowledge workers using Kyndi technology to be more productive. 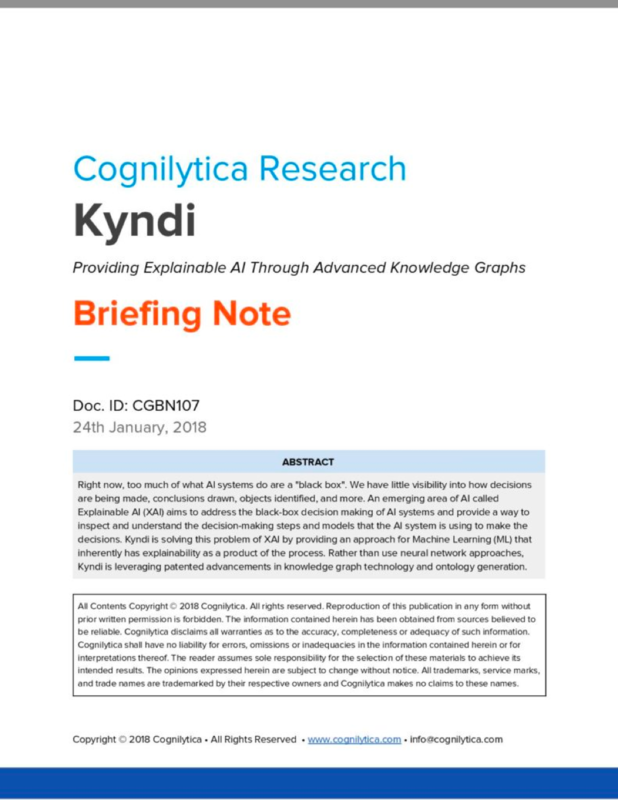 This whitepaper introduces the basic technology underlying Kyndi’s Natural Language Understanding. Kyndi Founder and CEO Ryan Welsh was quoted in the July 2018 report about the rising use of AI and intelligent automation in the financial services sector.